one red paperclip - Kyle MacDonald: Let's make a swap! That's right! I will send you a highly-coveted one red paperclip patch if you send me an original (on paper) newspaper/magazine article about one red paperclip to the address below! Yes, that's right, they're highly-coveted. You can send just the article, or the full newspaper, whatever works for you. 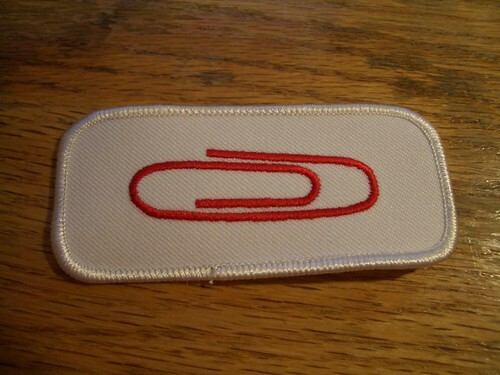 Be sure to send me your full mailing address so I can send you your one red paperclip patch! I wonder how many swaps we can make?! PS - I made this offer back in April too, and well, um, I didn't exactly have any patches ready at the time and, um, they're just finally being mailed out this week.....sorry for the delay guys....BUT this time they're ready to go right away! I think everyone at the Montreal post office just quit when they saw this post. This is much more entertaining than the million dollar homepage. You should send Alex a box of red paper clips and some socks. Your story has been posted in Norways second biggest newspaper, but so far only in the Internet edition. They have given the story a little twist, because (as you probably know by now) the paperclip is a Norwegian innovation, and during WW2 the Nazis used to confiscate paperclips, as they were commonly used by the Resistance as a anti-nazi symbol on their sleeves. The newspaper (Dagbladet) has gotten the idea that you live in Phoenix now, and that you have reached your goal to have your house, so maybe the AP story isnt entirely accurate? Keep doing your thing! Love your blog! I found out about your blog ´cuz I read the whole story on Norway's second biggest newspaper, Dagbladet.no. I'm Guatemalan, but live in Norway. If they print the story, I'll send it to you. But, let's trade: I'd like to give you a red CD for your red paperclip. What do you think? Wanna know what kind of CD, take a look at my blog on singer and songwriter Ricardo Arjona. Andy Serwer just talked about you on CNN's American Morning - the Minding Your Business segment. I read your story in the San Francisco Chronicle. Good luck! Extraordinary...really. Saw it on CNN.com, so prepare for the influx of many readers...hope your server can handle it. I saw the video link on Yahoo news!!! Some reason I am really excited about this. I am buying a local paper this morning and checking! Yo dude, if you actually can get a swap with the GENERAL LEE, you become my hero!! Brilliant! I just stumbled across you on Yahoo News. If my owner brings me a copy of Arizona Republic to squat on today, I'll try to find a hard copy to mail you. Wouldn't that patch look great on my doggy bed! Thank you for your insightful creative use of time and energy... so refreshing to read about the human story of connecting with each barter (as opposed to mass marketing for millions.) Don't get me wrong, if I come across that item that everyone wants that will make me rich... I'll sell it. But your journey is inspiring! Just an add-on: I was in Canada (Hamilton ON) for about 2 years, and I just like a lot when I can communicate with someone from that wanderful land!!! LOL, when I got onto your site my iexplore.exe mem usuage jumped from the ##,###K to ###,###K.
This is a great story and great blog! I usually don't get into the whole "blog" reading, but I must admit, this site is great. I just read the fan story about your parents. It was hiliarious. I am in Georgia and will check my Atlanta Journal when I get home to see if they printed an article. Hey Kyle this is awesome, and I am giving you kudos on your creativity! 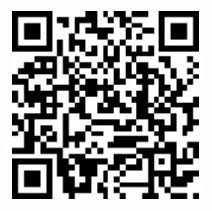 I just linked your blog to mine so others can follow. Keep it up, we'll be watching!! i knew about this a few months ago when we were talking about barter in out A Level Economics lesson here in UK. I was even just thinkin about this today when i stumbled across happynew.com, where this story is on their homepage. this is amazing, you are crating history! I just read your story at a brazilian online news portal. just read about you on yahoo news.. pretty cool story!! keep it up.. wish you the best of luck!!! Kyle, you are my hero!! Your story is about the coolest thing I've ever read. Lots of luck to you! Your copy from the Tallahassee Florida newspaper is on its way to you! It was picked up by the AP Wire Service. Your absolutely amazing, if you ever get to Florida hub and I will have to meet you! Holy crap. For real. I actually have that article. I read it today in the Toronto Star. My friend I'm not sure if you know much about making websites, but coming up with unique and interesting ideas is how to get large amounts of traffic to them. You have a really great idea. The moment I read it, I thought, "Wow, this can really work." Good on ya. And I hope you do get that house. I just might enter that contest! Nice job buddy. Make the hometown proud. Read your story on New York Post this morning. Brilliant idea! I heard about your red paperclip trade up-plan on Saturday in NJ while visiting family for Easter. This morning I saw you on GMA. I put in a call to a local real-estate friend of mine this morning to see if she can help you out. Ever consider moving to Delaware? You made CNN's Offbeat News! I just read this on CNN.com...sounds very cool and creative! bellissima idea... domani comprerò i giornali e quando troverò un'articolo che ti riguarda te lo spedirò! i just read the article on yahoo news and popped a copy of it via usps. hopefully it finds it way into your po box! It hit the front page of the Eau Claire Leader-Telegram here in Wisconsin today. Article is on the way to you for the patch. I just read this on CNN.com, and I think you're so cool! Keep up the chase. Saw your story in online CNN news. Have sent your "newswire comment" to my local newspaper. Who knows? Kyle - Pure and total Genius! You give hope to the rest of us bloggers. Hope you don't mind but I posted an entry today spotlighting your plight! If you're ever in Philly look me up and I'll buy you a beer! That's so cool. I just read the AP story today. They're also very happy about the paper clip, because it's a Norwegian invention. There's even the picture of a commemoration stamp. Good luck with your swapping! I just read about this on the CTV website. When I was in high school, a church youth group I went to did something similar. We'd start with a quarter or something, and knock on doors asking to trade for something bigger and better. One of the teams was offered a car once. I hadn't thought about trying to trade for a house, but I guess you're pretty close now. I'm guessing you've received a few marriage proposals by now, right? Incredible story. Wish you the best. The wife and I are trying to figure out how we can afford a house in the DC area. We just may have to try your strategy!! Dude, you rock so much! This totally restored my faith in humanity! (but it is Midnight, so we'll have to see if it lasts until morning...) It's really awesome to see the Interweb live up to its potential. I'm sending you the article with an envelope and stamp because I feel bad about you having to send out all of those patches with your own stamps. I'll choose a pretty one, don't worry. Man, I just bought the newspaper. Remember? Dagbladet.no? I emailed you about this yesterday. They have written 11 lines about your story, but they got it wrong. They claim that you are living in Phoenix with your girlfriend. You are not living there, right? They will probably give you a call and interview you. It was my tips. Wow You have made me Stronger In Achieving My Goal to Make my Dream come True . i live in Korea and saw an article on you and your big red paperclip. Hope you get a huge house. Congratulations, your story has reached Belgium. U are a star on the world. U are in the "internet celebrities"
u have a housse ? what do you want now ? I'll try to find an original copy for ya! P.S- I'm a Geog major from UBC as well! You make me proud! Cheers! I saw the article in Mexico' most imortant newspaper (north) and I'm sending it to you.. I have been looking for it in Finland but things come here really slowly. I can read Finnish alright. I am looking for something that says Mies hanulla on punainen liinin or something like that. Kyle~ WOW! Keep the dream, and you'll have your house! I am sending you an artical, from the Kansas City Star. Am sending the article from the Phoenix Arizona Republic today. Your unbelievable story got all the way to tiny Israel. It's on the web site of one of two Israel's biggest newspapers. although you probably can't read Hebrew :-) trust me - that's your story. Just heard about this on the news on the Channel 10 evening news in Australia. Don't you love what this world can do? Congratulations. Have a good time in your new house! Hey I saw this story on one of Australia's top rating 7:30 shows! Awesomely cool story, amazed at how valuable a red paperclip can be! You have made it in AUSTRALIA! last night, along with millions of other people, i saw you on channel 10's late news and again today on "beyond tomorrow" on channel 7! good job mate, your an idol! Hola guy, You are known in Czech Rep. by your business.You are in today´s netpress.http://bleskove.centrum.cz/udalosti/clanek.phtml?id=23914 but its in czech. Kyle, have just read about you, the blog and the swap in The Age, the broadsheet from Melbourne, Victoria, Australia. Will get a copy for you to-day (it's the 13th July here while you'e still on the 12th over there) Congratulations, mate. Wonderful idea - and proves just what can happen. I hope your new home and the town of Kipling are wonderful for you. Congrats to Kipling for being so ready to take on a novel idea and get their community on the map. Love small creative towns like that! My kinda folk! You were written up in Todays Sydney Morning Herald - Cool! congrats on the house. You made front page news in the Saskatoon Starphoenix (not that far from kipling... but still kinda far) I don't suppose it would be wise to send things to Quebec anymore, where should we send the news articles? haha. i love the whole story line of it! my friends and i (highschoolers) are going to soo start something like this its awesome your awesome!! I only heard about your story today, at work, but I think its awesome. Was there a game plan?? Kyle, i´m from SAntos, Brazil and i sent to you some articles from our newspaper, but i sent it to your older adress. Is that a problem? I´m eager to get my patch and sew it on my backpack. no worries - I'll get it somehow!